Reptile shows kinders Melbourne, child care Melbourne, Snakebusters. Melbourne's hands on reptile shows in kinders. Call: (03) 9812 3322 to book! Child care centre shows in Victoria, with an unmatched perfect safety record. Also Melbourne's best children's parties and hands-on kids birthday party show entertainment. If you run a child-care centre or similar, forget the worries related to getting someone into the place to entertain or educate the kids. Snakebusters will bring everything that's needed. Remember, Snakebusters are independently rated Australia's best reptiles, meaning no other travelling reptile show matches our standards. With Snakebusters, you simply sit back and watch the kids become captivated by Australia's only "hands on" reptile show. Yes, only Snakebusters let the kids hold the animals. All other companies are "hands off", "show and tell" or boring "static displays" only. Typically the children are sat in a group with Raymond Hoser/Snakebusters and the critters placed where all can see him or his staff. The show always begins with the best snake safety and snake awareness presentation in the industry. Yes, it includes all the deadly snakes! Because ours are vet certified surgically devenomized and totally safe, it is the only risk free reptile show in Australia and why we alone can legally cart deadly snakes anywhere. This safety lesson is essential for the kids as they must know not to touch or handle wild snakes that may be dangerous. Furthermore with our snakes we can give the full lesson in a way that de-demonises the snakes and makes sure the kids know that not all snakes are to be handled and what each kind looks like. Snakebusters have been bringing devenomized snakes to kinders for years and are alone in the reptile industry with a perfect (zero incident) safety record, as would be expected with the use of devenomized snakes. For the most important part, the "hands on reptiles", all the reptiles we use are the harmless kinds, such as pythons, small crocodiles, lizards and the like. As harmless reptiles are used in the kinder/childcare setting and they are tame, the fear factor is usually nil for most kids and the Snakebusters team also makes sure of this, while at the same time re-inforcing the "no owner -no touch message". When the reptiles are brought and out shown to the kids, we let them hold them if they want. Other outfits visiting kinders at best only allow touching the reptile's tail, but Snakebusters are alone in "full on - hands on" where the kids can actually hold the reptiles if they want. The bravest kids go first and soon it's "Monkey see, monkey do" with most kids wanting to hold reptiles and then not wanting to let them go! Snakebusters are alone in the reptile demonstrations industry in bringing lots of reptiles out at a time if need be, so that kids don't have to wait their turn to hold a reptile. They can all have instant gratification. Notwithstanding this, there are occasionally some who have a deep fear of anything scaly and they are not pushed into doing anything they don't want to. Hence at the end of one of Snakebusters eductional reptile displays, everyone feels that they've had an experience to remember. Parents are also invited to attend the display as they too will learn from the experts. Forget all the alternatives. Nothing competes with Snakebusters, Australia's Snakeman Raymond Hoser his magnificent staff, live snakes and the other reptiles to give the kids a good fun time and make your child care centre a place for early childhood learning. Raymond Hoser has two young children of his own (aged 2 and 4 in 2004) and so he knows their "on" and "off" buttons like only a parent can. Pricing is from $300 per session (2011 rates) and less per session if several are booked at once. Warning: Children exposed to snakebusters reptile shows may badger their parents for a pet python or lizard! General notes - all shows, displays, etc. If interested in these please read this link first. Print out a colour leaflet for Child care centres/Kinders. Reptile (snake) parties for children. © 2015 Snakebusters® kids kinder incursions and children's parties, kids reptile education educational shows with reptiles and parties, kids birthday party and parties in Melbourne, Victoria, Australia. Snakebusters are Australia's most sought after kids reptile party and parties, with most hands on, most audience interaction, best educational outcomes for incursions and with the best reptiles displayed. 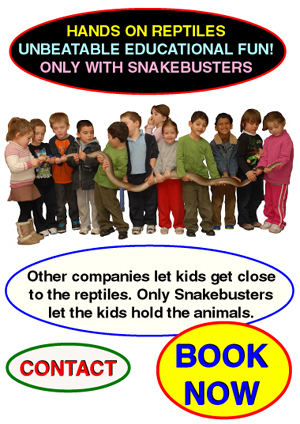 Snakebusters specialise in kids birthday party and parties and party with reptiles and snakes, kids events, kids education and kids school incursions with reptiles shown to the kids and handled by the kids, throughout Melbourne, Victoria and Australia. All rights reserved. Snakebusters® and Reptile Parties® are registered trademarks in several categories and jurisdictions, including for kids birthday parties, kids events, kids school incursions, reptile incursions, reptile demonstrations for kids and adults, deadly venomous snake displays, events, courses and the like in Melbourne, Victoria, Australia and elsewhere. Unauthorised use, misuse, dilution or other activities relating to the trademarks is prohibited, including in Melbourne, Victoria, Australia or anywhere else where we exercise trademark rights and intellectual property rights, including for: kids parties Melbourne, Reptile shows Melbourne, reptile shows in child care centres, reptile shows in childcare centres in Melbourne, reptile shows in kinders, reptile shows in kinders in Melbourne, reptiles demonstrations in kinders in Melbourne, Victoria, kids kinder shows where the kids hold the animals®, kid's kinder incursions, Melbourne, Victoria, Snakebusters, Australia's best reptiles, educational child care centre reptile incursions, Melbourne, Victoria.